If I asked the question, "How many of you deal with worry?" I'd guess that almost every hand would go up. We can think of plenty of things to worry about. The weather. The fatal outbreaks of tornadoes across the U.S. The state of our nation. The political instability around the world. The cost of gas. According to the Journal of Clinical Psychiatry, 40 million Americans have been diagnosed with anxiety disorders. That's more than the number of Americans with cancer, heart disease, and lung disorders combined. These anxiety disorders cost us $42 billion a year. Many of us live in the grip of anxiety. Why? What are some of the causes? Constant noise-that comes from cell phones, radios, satellite radios, TV, satellite TV, internet, iPods, and the list goes on and on. The constant roar of noise causes anxiety. Fractured families. No surprise there. That this would cause anxiety. The sad thing is that more and more families are being fractured. Being disconnected. We're all in our own little virtual worlds. The more we communicate (digitally) the less connected we are (socially)-to people. Financial struggles. Many people are broke. And many are saying "If I could just get up to broke, I'd be happy." Americans are buried in debt. They say electricity in our 24 hour lifestyle causes worry. The last thing we do before we go to bed is turn off a glowing screen. The 1st thing we do when we wake up, is turn it on. Things are constantly vibrating, buzzing, blinking, and playing crazy ringtones at the most inappropriate times. Another cause of anxiety is working too much. 25 years ago the average American workweek was 40 hours, today it's 50. No other nations in the world, other than Japan, work as much as we do. Weight gain. All my jeans are skinny jeans. I thought for sure the tag said "relaxed fit?" It did. It might be time to go with the elastic waistband. Anger or depression. You're always getting mad or always getting sad. A nervous eye twitch is another one. It looks like you're hitting on people. "Why is your husband winking at me? Is he a habitual flirter?" No he's just worried. When her husband sees it, he's going to be even more worried. Another sign is canker sores. Those make life really fun. Then you start to worry that you'll never get rid of your canker sores-and they just get bigger. Another sign is reliance on caffeine. You see people walking out of the convenience store with a Rickers pop, the size of a small bucket. They put it in the car, and the car tilts to one side. And they do this every morning. "Well, I'm just jittery until I have my Ricker's pop." Do you really think 2 gallons of sugar and caffeine will really help your anxiety levels." Now what does the psychiatry journal recommend for anxiety? Therapy, anti-depressants, minor tranquilizers, yoga, aromatherapy, acupuncture. But for me as a Christian, the first question is does God have anything to say about worry? And He does. In fact here in Philip. 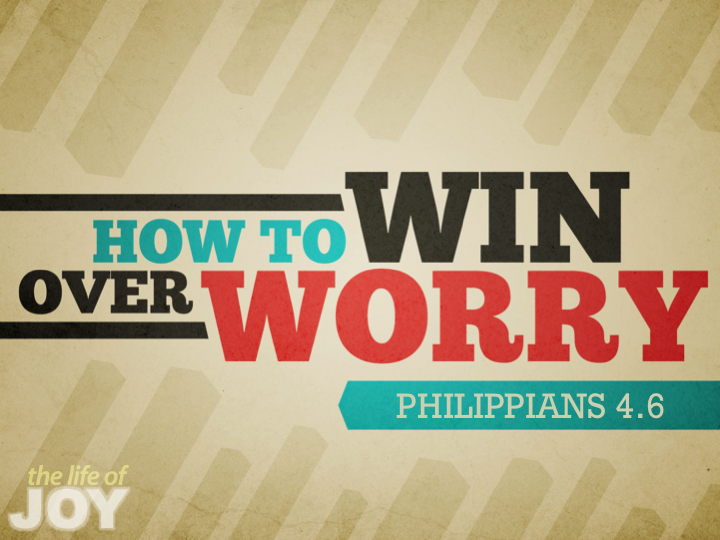 4:6 we're going to see how as a Christian, you can win over worry. How can you win over worry?